The AT-1 automatic volume controller has been designed to be used in conjunction with the Sentry Mk2 environmental control unit. 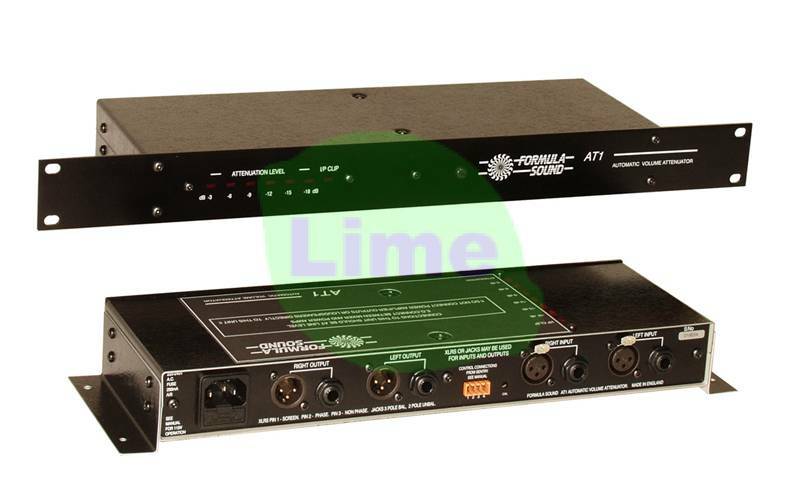 It is a stereo unit and its purpose is to control the volume level of an audio system connected to it. It will control the connected system to the maximum level allowed as defined by the Sentry Thus removing the worry of having to continually watch levels so the system is not cut off completely. It does this without affecting the dynamic range of the music being played very much along the same lines as the AVC2, but now the control chain is microphone driven monitoring the actual sound pressure level (SPL) in the venue so the amount of absorption that takes place when a venue is full of people is automatically catered for and calibration is no longer required; therefore any system may be connected and controlled. It is in the interests of a visiting band or DJ to connect to the AT-1 so that they do not suffer the embarrassment of being cut off if they play too loudly. Obviously the visiting system has to provide a suitable connection to their system. More than one AT-1 unit may be connected to the Sentry MK2 to control more than one audio system in the venue. This is particularly useful so that the house system and a visiting system band, etc. can be controlled to the same maximum level. The Sentry will automatically control the AT-1 that is in use. The AT-1 will only work when connected to a Sentry. It will follow the level that the Sentry is set to therefore if the Sentry is switched to work at a different level the AT-1 will control to the new level. If the visiting system is not connected to the AT-1 the Sentry will control it in the usual manner by switching the available mains power. We feel that this will encourage visiting systems to want to be connected to the AT-1. The AT-1 is available in 19 inch rack mount or wall mounting versions.